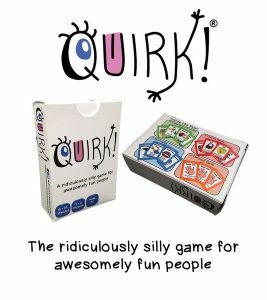 The aim of the game is to win as many Quirks as possible. A Quirk is 3 of the same character card. To win character cards from other players you must make sounds or actions of the cards you want to a specific player in hope they have it. If they do they pass all copies over to you, if not they tell you to Quirk! and you pick up from the deck. The game finishes once all the cards in the deck have been played and you count up your Quirks at the end. The game also includes Tactic, Defence and Skip cards, allowing you to steal Quirks from other players, Defend your Quirks from other players or make other players skip their go.